This edition: Kraft Singles, which are made from 16 separate ingredients that we’ve broken down in the exact order they appear on their website. 1) Milk: This probably goes without saying, but cheese is essentially curdled milk. 3) Whey: Whey is essentially the liquid leftovers after milk has been curdled and strained. It’s usually added to processed foods as a source of protein and to add bulk. 4) Milk Protein Concentrate: Milk protein concentrate is a form of powdered milk that provides the same proteins found in fresh milk. As such, this is the primary contributor to the three grams of protein found in each slice of this cheese. 5) Milkfat: Milkfat is the fatty portion of milk, which is usually added to processed foods as a means of adding heartiness and oftentimes a sort of creamy texture. 6) Sodium Citrate: Sodium citrate is the sodium salt of citric acid (a sour flavoring agent and preservative derived from citrus). It acts as a preservative and can provide a sour taste when added in high amounts. 7) Calcium Phosphate: Calcium phosphate can be taken as a calcium supplement, but it’s also added to foods as a thickener or stabilizer, meaning this might help the many ingredients in Kraft Singles meld together. 8) Modified Food Starch: Modified food starch is extracted from the source (corn, potato, tapioca, rice or wheat), then treated physically, enzymatically or chemically to partially break down the starch. It’s typically used to add bulk, or as a batter to give foods a light, crispy texture. 9) Whey Protein Concentrate: As Dagan Xavier, ingredient expert and co-founder of Label Insight, explained to us during our investigation of protein powder, this is a form of whey protein (the protein-packed leftovers of cheese production) that contains a significant amount of whole nutrients. 10) Salt: This is added for flavor. 11) Lactic Acid: Lactic acid is a sugar added for acidic flavoring. It’s the main sugar in milk and can also be used to speed up the coagulation process of cheeses. 12) Annatto and Paprika Extract: These give this cheese its bright yellow color. 13) Natamycin: A mold inhibitor produced by bacteria, natamycin has been widely accepted as a natural alternative to chemical preservatives. It’s also used to treat fungal eye infections, which may leave a bad taste in your mouth (metaphorically speaking). But multiple studies have shown natamycin to be completely safe for human consumption. 14) Enzymes: As explained above, enzymes accelerate the process of coagulating milk into cheese. 15) Cheese Culture: Cheese cultures and enzymes do more or less the same job. 16) Vitamin D3: Because dairy companies have long suggested that their products help kids grow big and strong, some cheeses — like Kraft Singles — are fortified with vitamin D3, which helps the body absorb calcium and promotes bone growth. 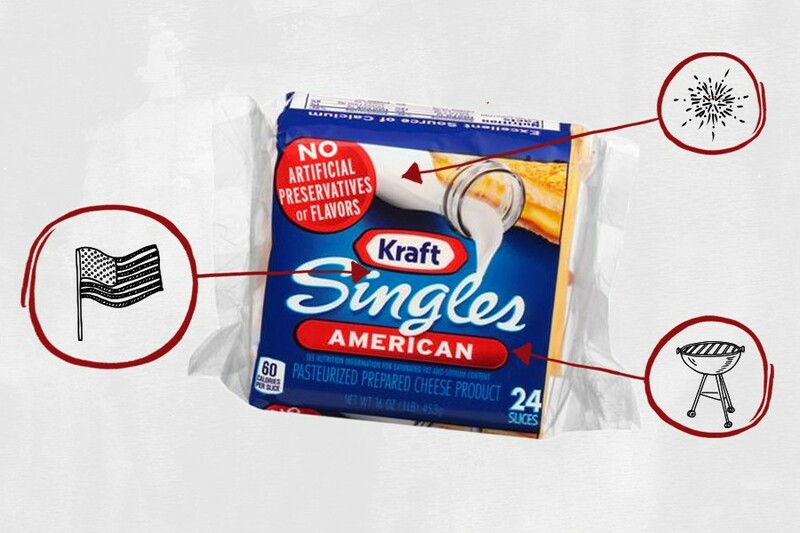 I was truly shocked to find out that — as the label proudly claims — Kraft Singles aren’t in fact pumped with tons of artificial preservatives (and frankly, also shocked that they contain actual cheese). In fact, the vast majority of these ingredients are relatively harmless. Still, Kraft Singles basically add a bunch of extra calories and saturated fat — which raise cholesterol levels, and therefore, increase your risk of heart disease and stroke — to anything you put them on. A 2014 study even found that eating a diet high in meat and cheese (aka, the Fourth of July diet) during middle age can double your risk of death and quadruple your risk of death by cancer. On the plus side, Kraft Singles are a surprisingly solid source of protein and calcium, so whether you go cheeseburger or hamburger is really up to you.